On behalf of the Kindness Malaysia team, I want to extend best wishes to Muslims in Malaysia and around the world. Ramadan Kareem. Like many people of different faiths who have known Ramadan through our communities and families, we know this to be a festive time. A time when families gather, friends host iftars, and meals are shared. But we also know that Ramadan is a time of intense devotion and reflection, a time when we fast during the day and perform tarawih prayers at night, reciting and listening to the entire Quran over the course of the month. These ibadah remind us of the principles that everyone hold in common, and Islam’s role in advancing justice, progress, tolerance, and the dignity of all human beings. For instance, fasting is a concept shared by many faiths, as a way to bring the heart closer to God, and to those among us who cannot take their next meal for granted. For all of us must remember that the world we want to build and the changes that we want to make must begin in our own hearts, and our own communities. This Ramadan, our volunteers across Malaysia have planned the TajaMereka Project where we offer others to sponsor the needy to break fast and also the opportunity to mingle with them all together. 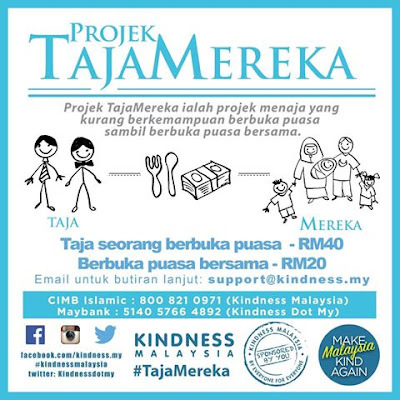 Sharing kindness with others especially during this holy month would be a sweet deep memory that is not to forget. In these challenging times, this is a spirit of responsibility that we must sustain in the months and years to come. At this time of renewal, I want to reiterate my commitment to a new beginning between Kindness Malaysia and other NGOs in Malaysia and around the world. This new beginning must be borne out in a sustained effort to listen to each other, to learn from each other, to respect one another, and to seek common ground. I believe an important part of this is to work together, and in the last few months, Kindness Malaysia have been working closely with other local NGOs, international NGOs and even NGIs in order to make Malaysia a kinder place to live. All of these efforts are aimed at advancing our common aspirations, to instill kindness to everyone hearts, regardless of their background, skin color or creed. It will take time and patient effort. We cannot change things over night, but we can honestly resolve to do what must be done, while setting off in a new direction toward the destination that we seek for ourselves, and for our children. That is the journey that we must travel together. I look forward to continuing this critically important mission and turning it into action. And today, I want to join with our core volunteers, sponsors and supporters in welcoming the beginning of Ramadan, and wishing everyone a blessed month. May Allah provides barakah to all.